I don't even know where to begin with this review. I can't tell you just how much I adored Roomies. It was perfect! I would have read it all in one day, but you know, life, work and kids tend to cut my reading time. LOL But I did read it in 2 days! LOL So I still read it pretty fast. I am going to do something a little different with this review because I honestly feel like I need to share everything I love about this book. Is there romance? Yes, Yes, YES! And the one thing that I love the most is that it's not that insta-love I despise. I can't stand when characters just magically fall madly in love with one another. Infatuation, lust, yes, but I don't think it's called love. Holland was lusting for Calvin big time when she first met him in the subway while playing his guitar, but Calvin had no idea. When she had her little "accident" in the subway that made their two world's collide, is when the wheels we set in motion for any type of feelings. For some reason, I have a soft spot for secondary characters. In this case I fell madly in love with Holland's uncles. Their love for their niece is unconditional and I just love them as a couple. They are the sweetest and cutest and I wish they were real so we could be BFFs! 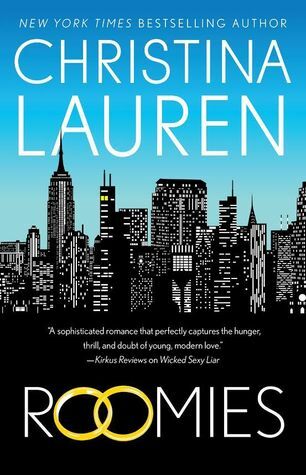 So, if you are looking for a fast-paced book with memorable characters, that will stay with you even after weeks of finishing the book, then Roomies is the book for you! Get it for yourself and/or give it as a gift to someone who love it too!